Tokyo, Taka Ishii Gallery, Christopher Wool, November-December 2004. Christopher Wool has quickly emerged as one of the most important abstract painters of his generation, perfecting his craft since his first experimentations in the 1980s. Wool's early techniques involved stenciled rollers, showing his main interest in paint application; in the late 1980s he transitioned to using rubber stamps and stenciled words. In shifting away from the ready-made implications of the rollers Wool explored the additive and repetitive nature of stamping patterns. In the early 1990s, Wool abandoned the use of rubber stamps and rollers in favor of the silkscreening process, yet continued to embrace the stylistic effects of his prior techniques, repeating decorative floral motifs to blur the lines between ornamentation and abstract painting. In Untitled, Wool has moved to yet another modus operandi, perhaps the most mature method of his career to-date. 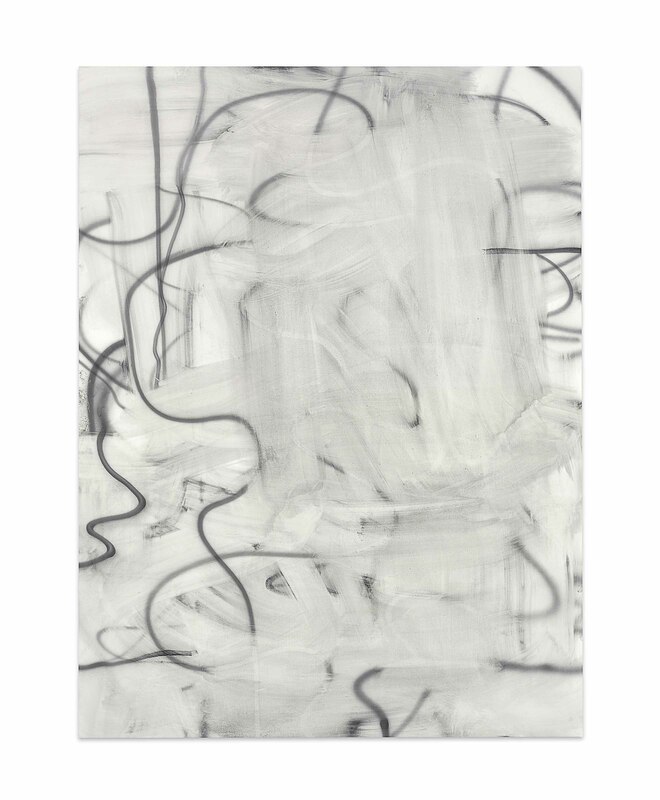 He draws large gestural swirls on the linen with a spray gun, and then wipes the paint and the linen with a cloth soaked in solvent, removing the paint to create strokes and blurred patches of grey tones across the canvas. Wool once declared, "I became more interested in 'how to paint it' than 'what to paint'" (C. Wool, interview with A. Goldstein in A. Goldstein (ed. ), "What They're Not: The Paintings of Christopher Wool," ed. A. Goldstein, Christopher Wool, exh. cat., San Francisco Museum of Modern Art, San Francisco, 1998, p. 256); and Untitled demonstrates Wool's progress in continuing to explore the endless ways to create painting. This spray paint series lends itself to the creation of strong yet balanced compositions, creating multilayered and intense works through the removal of paint. Wool has explored the dynamic between depth and flatness, foreground and background since the 1980s. Untitled and the corresponding series address the exploration of this tension in its truest form - Wool creates the depth himself in the removing of paint layers, rather than allowing the flat black and white images-as seen in both his floral and text series-to create only the illusion of depth with the viewer. The work draws on a concept found in Robert Rauschenberg's Erased de Kooning Drawing 1953; both artists engage in the unconventional act of un-making art in order to make art. Wool adds thick layers of paint and then partially removes and digs into these layers to create a multilayered and intense work. He explores the true nature of the physicality of the act of painting, the gestural movements of the arms and hands as an extension of the painting tools, a key concept in the Abstract Expressionist movement, particularly in the drip paintings of Jackson Pollock. Both Wool and Rauschenberg partake in the unconventional artistic act of removal and redacting, an act not often associated with painting and drawing. Rauschenberg erases completely a drawing by another artist, whereas Wool's deliberate removal of the paint has created an entirely new image from this redaction. With Rauschenberg as a pioneer of the concept, Wool wipes the paint off the surface of Untitled, and makes the work precisely by unmaking it.